Amazing Spider-Man #219 was published in August 1981, which means this month this issue is celebrating a milestone 30th anniversary. I know this because, in addition to knowing basic math, today is my 30th birthday. So, happy birthday to ASM #219 and me. There’s no significant story behind my acquisition of ASM #219 – it was one of many issues inside that giant box of comics a friend of my wife’s picked up for me years ago. Nor does it feature any significant storyline developments in Spider-Man history. But that’s not the point. I think we all have a natural fascination with the circumstances around our birthday – what was in style, what was the #1 song on the Billboard charts, what was on the front page of the newspaper? There’s a plethora of crap that’s marketed to people with this fascination. So as a die-hard Spider-Man collector, ASM #219 will forever be a personally significant issue. And I’d much rather own this issue rather than a facsimile of the front page of the New York Times from Aug. 3, 1981 (though if anyone got me that, that’s still cool). Now, as I’m sure some of you die-hards reading this post are yelling after this post’s first two paragraphs, ASM #219 actually has some neat history behind it if you’re a comic book aficionado. The cover is one of only five ASMs (including two annuals) that were illustrated by renown comic book writer/artist Frank Miller, who’s probably best known for his epic run on Daredevil in the early 1980s, and his work on graphic novels such as Batman: The Dark Night Returns, Sin City and 300 (the latter two were adapted into blockbuster films). While Miller never got a proper run with ASM as a penciller and/or writer, ASM #219, along with ASM #203, #218 and Annuals #14 and #15 are a unique linking of an extraordinarily popular comic book series, with an immensely popular artist and writer whose generated a ton of acclaim and controversy in the years following his time as an occasional Spidey cover artist. As an artist, Miller is best known for his film noir style that resonates with a hardened maturity. 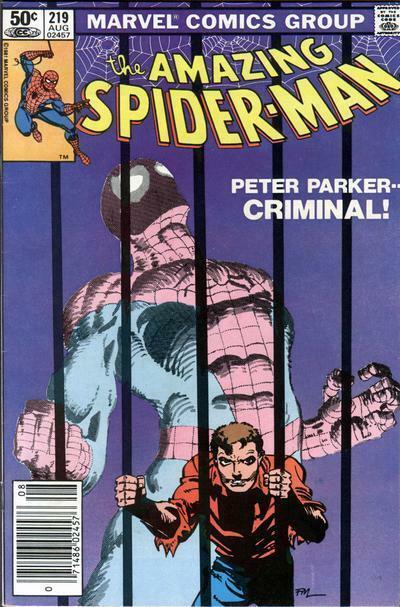 That style is certainly on full display here in ASM #219, with a shadowy, square-jawed Peter Parker looking particularly menacing behind bars while the specter of Spider-Man looks like he’s bellowing in agony behind him. As a writer, Miller is known for his racy themes that are full of sexual promiscuity and gratuitous violence. In other words, Frank Miller isn’t for kids. When I was in elementary school, I somehow got my hands on a copy of Dark Night Returns and I missed all of its brilliance and instead was just left confused. Why was Batman so old and fat? Why was Robin a young girl? Why did Batman rip out the Joker’s eyeball? What’s with the grotesque looking Ronald Reagan? Why are Batman and Superman fighting each other? It wasn’t until I re-read the graphic novel in my 20s that I learned to appreciate how Miller redefined the Batman character by putting his own very unique spin on it. In the process, he along with Alan Moore, who’s responsible for Watchmen, were creating a whole new genre of comic book storytelling. But how would I really know or care about any of this as a 7-year-old? So call it a cosmic coincidence that when in anticipation of my 30th birthday, I recently decided to check out which ASM issue was released in August 1981 and found that it was of a small number of Miller covers – the last one he did for ASM, in fact. How is that a coincidence? I guess it depends on how one views their 30s. My 20s were a decade full of moments of self-discovery – I finished college, met my future wife, married her, got my first job, left my first job and have come to accept that life is generally complicated and impossible to plan, but still satisfying as long as I’m with people who make me happy. All of these experiences have made me more hardened for my 30s, which will be filled with starting a family, settling into a long-term career and coming to terms with the potential and likely inevitable loss of some of those people who have made me happy over the years. In other words, today my life is on the cusp of evolving from the more traditional comic books-type tales of the 60s and 70s and to the edgier, grittier Frank Miller graphic novel-stories like Dark Knight and Sin City. I suppose there will be fewer prostitutes and murder in my 30s, but hey, I guess I have the next decade to see for myself. For now, I can just look at the ASM #219 cover and reflect and relate. Let me be the first to wish you a Happy 30th Birthday from Budapest, Hungary! I really dig your blog! Keep up the good work, and good luck for the rest of your quest!